For Lisa Price, the kitchen has always been a source of inspiration. Price, the founder and president of Carol's Daughter, has been mixing up her own homemade beauty recipes for nearly 20 years, starting her beauty business with $100 and a homemade lotion recipe in her Brooklyn kitchen. Today, Carol's Daughter's 300 products are still made by hand with natural ingredients, and Price can still be found creating new recipes in the kitchen — this time in a large New York City Office. 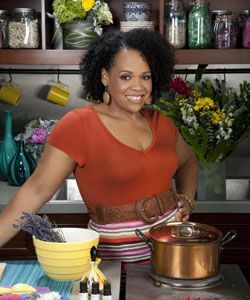 To add to her recipe success, Price recently launched Lisa’s Kitchen, a collection of do-it-yourself bath and body kits available on HSN. NaturallyCurly met up with her and talked about how she became one of the world's most famous mixtresses and how she has inspired others to make and share their own homemade hair treatments. NaturallyCurly: How did did it all begin? Lisa Price:I have loved fragrance since I was a small child, so I found a way to make my own fragrances by blending fragrance oils. Body-care products like Mango Body Butter and Honey Puddin’ grew out of that. At the urging of my mom, Carol (the inspiration for the company's name), I started selling my products at New York flea markets. Customers asked if I had any products for hair. When I said I had nothing, some would walk away from my table. I didn't want them to walk away, so I went home and developed Khoret Amen, a hair care oil for dry, damaged or relaxed African-American hair. It was actually pretty easy to develop, and we still sell it today. When the weather got cold, people came by my apartment to replenish their supply. Soon I wasn't leaving my house on Saturdays because customers were coming by. By the time I opened my first store in 1999, Carol's Daughter had sales of $1.7 million. NC: How did you learn to make homemade beauty recipes? LP: In the very beginning, I read a lot. I had books on essential oils and herbs and what things were used for what, both in the past and today. Then, I experimented. I was always tweaking things a little bit. If I read a lotion recipe that contained lanoline, I camp up with substitutes for lanolin. I was always reading labels of products on the market, approaching it like you would pasta sauce. Maybe you add a little extra garlic, fresh basil or extra mushrooms and see what happens. I was lucky because I had very willing friends and family to test my recipes. I made changes based on their feedback. Want to follow in Lisa's footsteps? Head over to our recipes page to upload your own recipes or browse others'. You never know - your rags to riches story could be featured next! Start creating today! NC: Where do you develop most of your recipes? LP: Most of the Carol’s Daughter lines have come out of the kitchen. Sometimes, I’ll create something in the kitchen and ask the lab to duplicate it. Other times, I want to work with certain ingredients but I want the texture of a certain conditioner. So, I'll say "How can I incorporate chocolate? How is it available so I can incorporate its benefits into this product?" I come up with ideas for bodycare products while I'm watching cooking shows. NC: What inspired you to put a kitchen in your office? LP: Initially, we talked about putting the kitchen in my office for educational videos or news pieces, but my office is so big and spacious that I've been able to move things from home so I don't have to worry about my 4-year-old taking out a bottle of fragrance. I love having the kitchen to experiment in. It is a working kitchen. There are days when I get an idea, and right then and there I'll concoct something. When I got into making body splashes, I went into the kitchen and began mixing oils together and put it into the fridge. NC: How does it feel to have inspired a whole new generation of mixtresses? LP: It’s really nice to know I’ve had that kind of impact. When I started out, I had a friend who was doing a similar thing. We felt like we were these two crazy ladies in Brooklyn who made things in their kitchens. It's wonderful to think of people looking at a jar of preserves and daydreaming about how to make it into a scrub.